Where do I begin? 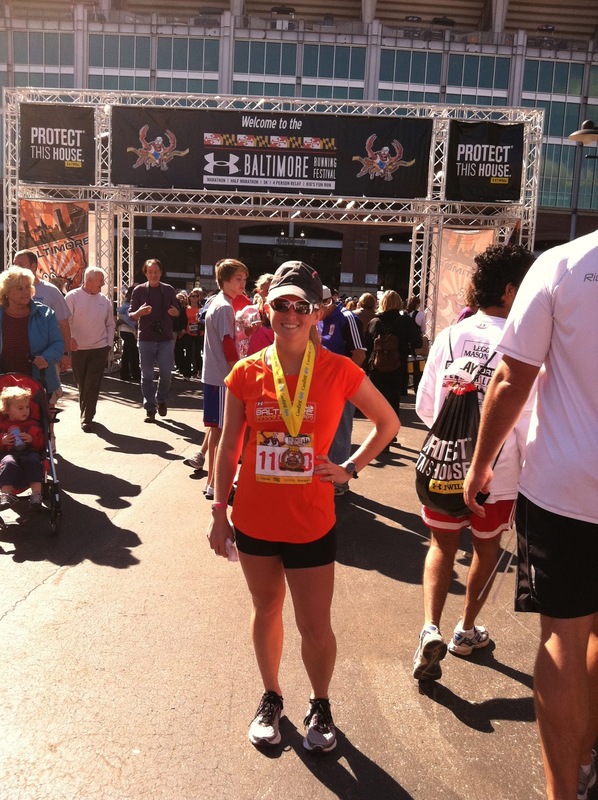 As a Maryland Resident and Baltimore native I felt it was my duty to run this race through the streets of Baltimore, Camden yards and ending of course in front of M & T bank stadium where the Ravens play. It seemed too good to be true. Well, my friends, it was. The Running Festival takes place in October, so the weather is perfect, not too cold or too hot. I took part in the half marathon, not the full so if you intend on running the marathon then you get to experience more of what the city has to offer. But the half marathon that’s a completely different story. But first some background. The expo was alright, you get an Under Armour t-shirt for registering which is lovely, but the rest of the gear on sale is overpriced. They do have shuttles for the free parking to take you to and from the expo, but my mother and I found ourselves just paying to park nearby. The full marathon takes you on a mainly downhill loop of the city, through the zoo, down along the inner harbor, throughout the Under Armour campus and then back up to meet with the rest of the half marathoners which then takes you through the not so nice parts of the city, followed by a finish down the home stretch (literally) through Camden yards. WBAL (the local tv station) broadcasts the race live and puts in their two cents (literally two cents as the reporters don’t have any clue as to what they are talking about in regards to running) but it is cool to see the leaders running throughout the race on tv. 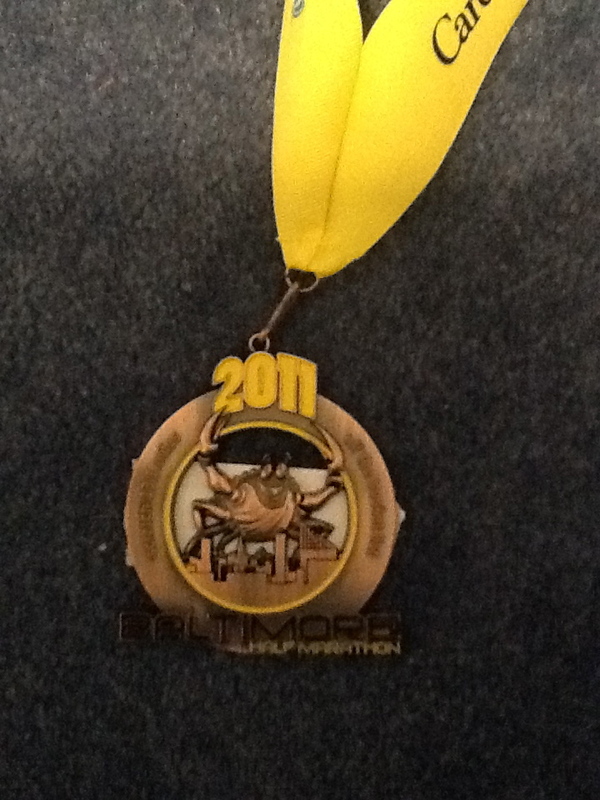 Perks- the medal is a crab and if you are a Maryland resident, anything with a crab on it is fantastic. However, you only get a medal if you complete the half or full marathon, not the 5k (which angered my mother immensely). But you do have access to the stadiums bathrooms instead of being forced to use port o potties which are nice. The marathoners and 5k runners get to start and finish in the same area whereas the half marathoners do not so don’t be fooled. Ehh… Not A Fan- Where do I begin. How about parking. Since they expect thousands upon thousands of people in the city for race day they suggest you take the metro. If you are driving expect to find very limited spaces, as well as traffic leading into the parking lots. Next let’s move on to the start times. Corrigan sports who puts on this races finds it to be a genius idea to have the marathoners start at 8:00 am and the half marathoners start at 9:45 so that everyone can merge and finish together. Not only that but if you have loved ones running the full or the 5k (which starts at 8:30) that means you have to wait around to start which I did not enjoy. Next when they do have the half marathoners start, you have to cross the marathon running route to get into your specific corrals which I’m sure the marathoners enjoyed immensely. Once the race begins its a straight uphill course through some lovely neighborhoods (sarcasm) and I’m pretty sure I saw some drug deals taking place along the side of the roads. and when I mean straight uphill, literally its one big continuous hill with some minor hills to lead you back to the big hills. And as someone who lives in the burbs and runs big hills every day, I figured this would be a breeze, but, in fact, it was not. If you don’t believe me, ask the winners of the races, they even said it was the hardest course they have ever run, almost as challenging as Boston. The only real downhill part of the half marathon is the last mile or so. There are specific cheer zones so you don’t see people very often except for the people probably still drunk from the night before handing out beer. Overall, I would have to say this was my least favorite race of the bunch. Maybe it has something to do with the course or the start times or my time (which was also the worst I have ever run) but still Baltimore is overrated and it’s definitely not worth the shirt. 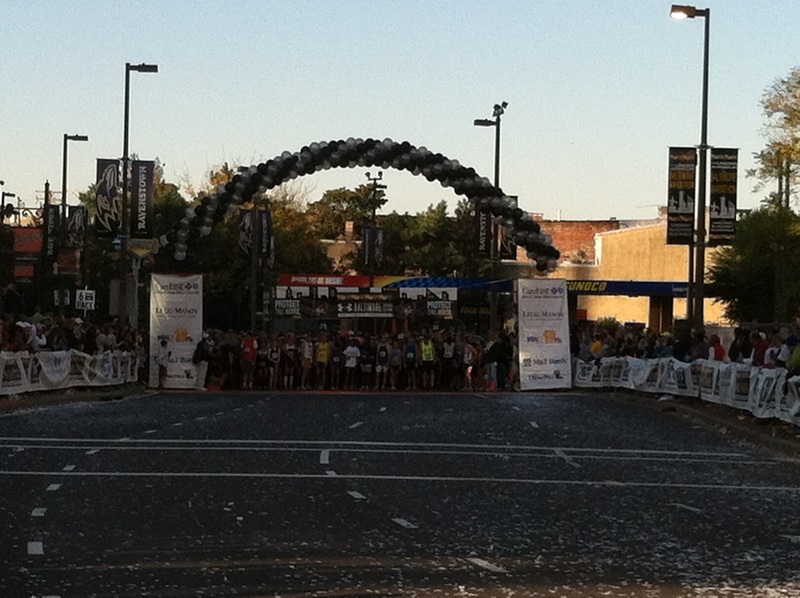 Needless to say, this was my first and last Baltimore Half marathon.